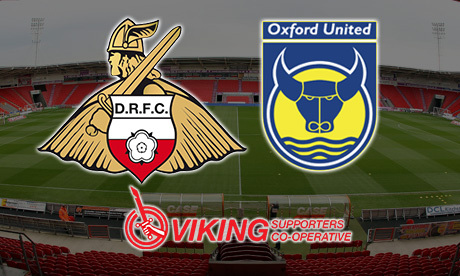 Doncaster Rovers take on Karl Robinson’s struggling Oxford United at the Keepmoat this Saturday. “Oxford is a team that are full of energy, and they have two very strong strikers, if he chooses to use them, and they have good experience and strength at the back. “We are in a really good spell of form at this moment in time and my message to the players would be just to embrace the challenges that we have coming up, because everyone has something to play for. Most of the players seem to have come through the Bury test okay with them having the entire of Thursday off to recover and spend time with their families. Rovers are joint top of the form table with Blackburn Rovers after collecting eleven points from five games. Oxford is 18th, picking up a dismal four points from five games. The last time these two sides met was back in December last year, when Oxford edged out a 1-0 win. However the last time they visited Doncaster, Rovers won 2-0 back in 2003 at Belle Vue, with goals from Paul Green and Tim Ryan. 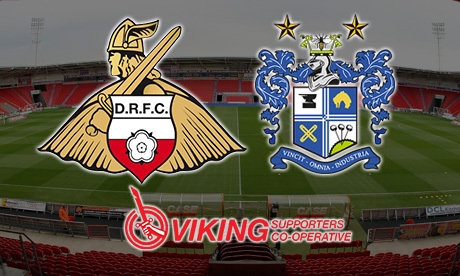 Doncaster Rovers look to keep their top-10 finish bid alive as they host already-relegated Bury this Tuesday evening. "We're not over the line yet, we can still get in trouble but obviously we're looking up the way rather than below us and tomorrow nights motivation for us is huge because there's a possibility we can go in the top 10. "You look at the recruitment they made in the summer - big names coming into the football club - ambitious. I always thought it would go one or two ways: they'd either have a really good season or it might got a bit belly-up. "They could do anything tomorrow, I have no idea what they're going to do in terms of personnel but it's never nice to see a club relegated but it might be a dangerous game for us because the fear factors to them now and that can come into." Joe Wright will be unavailable for Rovers this Tuesday evening after "rolling his ankle" in the win over MK Dons at the weekend. Andy Butler will come straight into contention to step into the void position to resurrect the partnership with Mathieu Baudry. Meanwhile, Alex Kiwomya will be treated carefully as Ferguson highlighted this is the first time the forward could be involved in two games over four days since his recovery from injury. Bury have lost their last seven consecutive games which eventually led to their relegation to League Two. Contributing to this poor season for the Shakers is the fact that on the road this term they've only picked up 0.4 points-per-game - leaving them with the worst away form in the league. In addition to their poor results, they haven't scored a lot either with them netting only 15 goals on the road, conceding 35 along the way. It looks even more unlikely that Lowe's team should score at the weekend with Rovers boasting the fourth best defensive record in the league, conceding only 46 goals in 40 games. Only Blackburn, Shrewsbury and Wigan have conceded less and Rovers have games in hand over all three! In the reverse fixture Rovers ground out a 1-0 win, before Lee Clark got sacked, after a goal from Ben Whiteman. The last time Bury visited the Keepmoat was in August 2015 where the game controversially ended 1-1 after two 90-minute goals from Harry Forrester and Leon Clark. Doncaster Rovers return to action after an extended break to face a Gillingham side who have lost their last three games. “Well when the manager Steve went in they went on a hell of a run and did fantastically well, they were probably looking at the play-offs themselves at one point. But then they’ve slipped away a little but, they’ve lost their last three games and a heavy defeat to Southend will have hurt them because they took a lot of fans there. “What we’ve managed to do is we’ve not suffered too many back-to-back defeats which is important, we’re now on the back-to-back wins after Bradford and Blackpool and we’re going into a game on Saturday that’s winnable but again it’s going to be tough because you would imagine that given what happened to Gillingham last time at Southend, they’ll be a reaction there. Rovers will be boosted by the return of Andy Butler and Andy Boyle to the side after their recoveries from injury. Tom Anderson will narrowly miss out on the game as he’s scheduled to be fit for action for the MK Dons game next week. Alex Kiwomya will also be available after his battle with a short illness which meant he missed the victory at Blackpool. Gillingham’s home form isn’t too strong as they’ve collected 4 wins from 18 home games, while Rovers have only 5 of their 20 away games so far this season. The Gills’ home form is consequently the worst in League One with them picking up 21 points from a possible 54. Although they have the worst home record it will still be a test for Rovers who haven’t won at MEMs Priestfield stadium since January 2007. Both sides do boast quite a good defensive record in the league with Rovers fourth best, conceding just 45 goals in 38 games – only Wigan (25), Shrewsbury (33) and Blackburn (36) have shipped less goals. Gillingham have the 7th best defensive record conceding 47 goals in 39 games. The last time both sides faced each other was on the opening day of the season where it ended goalless. Ady Pennock was in charge for that game but was later sacked and replaced by current manager Steve Lovell. 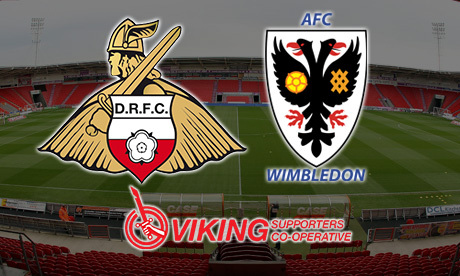 Doncaster Rovers entertain League One strugglers AFC Wimbledon at the Keepmoat today. Darren Ferguson feels that his side need to keep their energy levels high against a competitive Wimbledon who are fighting for survival. “We were really poor down there, it was a strange performance. We were way off the mark and it was one of the poorest I felt in terms of what we’re about, it wasn’t anywhere near the energy we’re about, so we need to get that right,” Ferguson begun. “I feel they’ve got good experience, Trotter and Abdu in the middle of the park, if it is them, they're very experienced players. Taylor up front, he’s one of the better strikers in the league, he’s a real handful. Forrester could play, we know all about him, he’s a good footballer and they’ve got good width in their team. Andy Butler had to watch Friday afternoons win from the stands as he narrowly missed out on a place in the team to Andy Boyle. Ferguson admits we may not see him return until the Gillingham game. Alex Kiwomya was another noticeable absentee from the 2-1 win at Blackpool; the 21-year-old missed the victory through an illness but should come back into contention for Monday afternoon. Wimbledon come to the Keepmoat with one of the worst away forms in the league as they collect on average 0.9 points-per-game away from home, while Rovers get 1.56 points-per-game at home. Only 18 of 37 Dons goals scored this season have come away from home, which may be a relieve to know for Marko Marosi. At the other end of the pitch, they’ve conceded 25 of their 50 goals conceded in total this season away from home. Rovers will want to bury memories of the last game as it was dubbed Rovers’ current worst game of the season after losing 2-0. This will be the sides’ only second meeting ever since The Dons reformed as AFC Wimbledon in 2002. Darren Ferguson is looking forward to taking on local rivals Bradford City under the flood-lights on Monday evening. “They went through a hell of a bad run in the league, they had to let club legend Stuart [McCall] go and bring in Simon [Grayson] who’s got fantastic experience and a lot of success in League One, but he has to hit the ground running because he’s only got until the end of the season. “I went to the game last night and it was a very close game, Wigan won it in the last minute, but they’ve got a competitive team and blend of experience and youth. Obviously, you would say the main striker in terms of threat, he won’t be playing - Wyke - because he’s suspended. “A bit of a derby, they’ll bring good support – a game I’m looking forward to and as are the players." Alfie Beestin has made a shock return to training after recovering from his injury quicker than first anticipated, meanwhile, Craig Alcock and Andy Boyle come into contention for Monday's game. Defender Mathieu Baudry felt a tight hamstring after the draw at Southend, but Ferguson confirmed the Frenchman is fine and Andy Butler is on course to return to action for Rovers' game after Bradford, Blackpool. Rovers remain 7 points behind their Yorkshire counterparts as Bradford come into the game with the joint poorest run of form with Fleetwood - who Rovers beat 3-0 the last time at the Keepmoat - after the Bantams have collected 2 points from 8 games. Despite this stat, Bradford does hold good away form as they've picked up 1.67 points-per-game on average away from Valley Parade, which sees them lay 5th in the away form table in League One, while at home, Rovers have picked up 1.46 points-per-game. 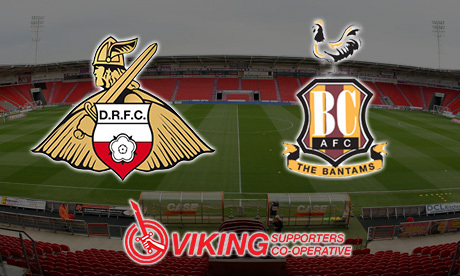 In the last encounter between these two sides it finished 2-0 to Bradford, and their last visit to the Keepmoat finished 1-0 to them in 2015, which was the first game after Darren Ferguson had been confirmed manager. The last time Rovers did beat Bradford in the league was in November 2014, when Paul Dickov's side won 2-1 away from home.